We specifically specialize in the art of artisan bread making. What’s the difference between regular commercial bread bought at a super market than artisan bread you asked? Well, the answer is very simple. 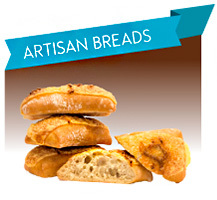 Artisan bread, different from commercial bread, have some times 1/3 of the ingredients or less. 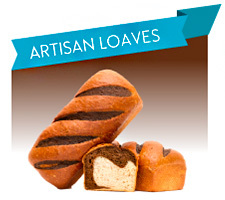 The basic building blocks of artisan bread are flour, water, yeast, and salt. 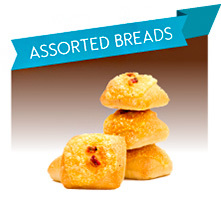 Natural seeds and fruits are added for specialty breads. Depending on the bread Egg and milk can be added. The baking process is also different. While a commercial bread baking process from start to finish can take around 2 hours. A single loaf or real artisan bread can take around 36 hours to be done. Reason why? Artisan bread don’t contain any chemicals or artificial agents that accelerate the fermentation process, this process is been done naturally, we patiently wait for it to take the time for it to rise and absorb the natural flavors of each one of the ingredients (olives, herbs or fruits depending on the recipe) then we carefully hand shaped them and take them to the oven. 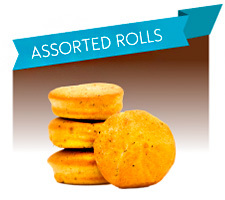 Often, steam is utilized during the baking process to produce the crispy golden-brown crust characteristic of certain varieties of them. In Bon Breads bread you won’t only see the difference but you can tasted, we exclusively use high quality natural ingredients that ensure the particular flavor and texture of a real traditional artisan bread that chemicals products cant achieved. So next times you are looking for bread remember, real artisan bread not only contain natural ingredients but the love and patient of a craftsmen that wakes up every day with the mission of creating the best quality bread for you to enjoy and keep the ancient tradition of artisan bread making alive.